FREE Craftsman 2.25″ Blade Folding Lock Back Utility Knife! You are here: Home / Great Deals / Christmas Deals / FREE Craftsman 2.25″ Blade Folding Lock Back Utility Knife! Sears has this Craftsman 2.25″ Blade Folding Lock Back Utility Knife on sale for $4.99 and you can get back $5.04 in Shop Your Way points, making it FREE! 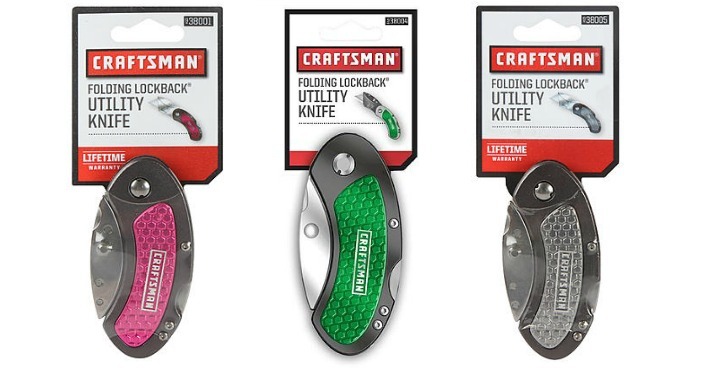 The Craftsman folding, lock back utility knife is sleek looking and easy to use. Enjoy the portability of the utility knife that easily bends into its handle for a compact size you can safely hold. Once bent, the knife forms a smooth oval that you can put into your pocket as you head to the next job. The small size makes it great for storing in your toolbox, too. Final: FREE PLUS FREE in-store pickup or FREE shipping on orders over $49!